The park includes shrubby areas and a pond. 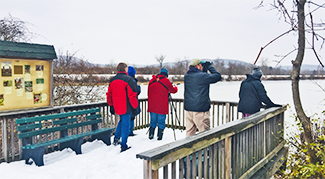 A trail around the pond leads to an observation platform donated by the Chemung Valley Audubon Society. The observation deck overlooks a larger impoundment of water with cattail edges. This impoundment ends at an old pasture. The west half of the Big Flats Trail passes along the south edge of the impoundment. An extensive cattail marsh lies along the south side of the trail. 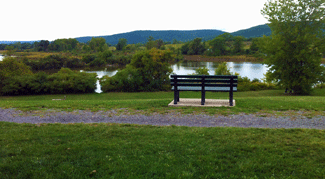 The east portion of the Big Flats Trail passes by shrubby wetlands, cultivated fields, and deciduous woods. From Route 17/I86, take exit 50 for Kahler Road toward Airport. At the end of the exit ramp, turn left onto Kahler Road North. Continue 0.4 miles. The entrance to the parking lot is on the right.